Our Gluten Free products are no longer available. Please view our full range for alternatives. Why is working with Gluten Free pastry so tricky!? Regular pastry made with wheat flour contains ‘gluten’. Gluten is formed when combining water and wheat flour, gluten gives structure. The more you work the pastry the more the gluten is activated and the more elastic the dough will become. As evidenced by overworked pastry when it pulls back or shrinks when baking. This is where things get a bit tricky with gluten free pastry, as there is no gluten and no gums are added to the recipe (as is the case with our GF pastry) the resulting pastry does not have any elasticity. 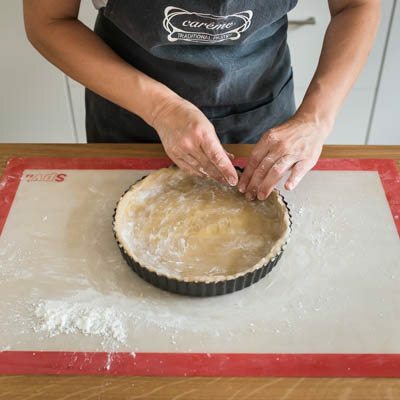 Coupled with the use of butter as the shortening, which makes it taste delicious and give it a crumbly flaky texture, you end up with dough that is very ‘short’. Don’t fear! It doesn’t need to cause consternation or tears there is a solution to creating beautiful tasting GF tarts. 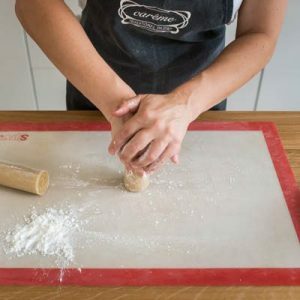 For a start put the rolling pin away – that’s right, you don’t need it! Dust your hands, pastry and bench with a GF flour, the rest is child’s play! You are going to use the ‘push’ method, the finished result will look a little uneven and rustic but the baked result will taste great. 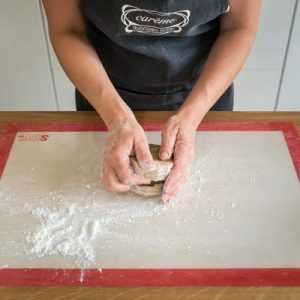 Cut the log of dough in half, use palm of your hand and push each half down to form a puck, push the two pucks together to create a ball like shape. Sprinkle with a little extra flour and begin to push the dough out using the heal of your hand, turning the ball as you go to create a circle. Keep the dough thick, at least 5mm. Place in tart tin pushing into the sides. Using a sharp knife cut the log into pieces. The size of each piece is determined by the size of your tart shell. For example: a 10cm tart shell holds about 40g of dough so cut the log into 10 equal pieces. Before cutting the entire log cut the first one and check that it fits the tart shell, using the push method as described above. You may need to adjust the size of piece you cut up or down. Again remember to keep the dough at least 5mm thick. 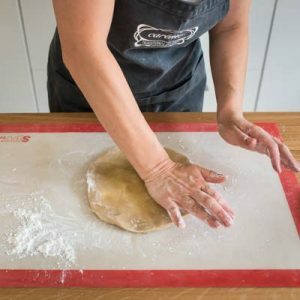 Line tart or tarts with baking paper and fill with ceramic baking weights or chickpeas. Bake at 180c fan-forced (200c non-fan). Remove weights, return to oven for 5 minutes. Keep the dough thick, ideally around 5mm or thicker should do it. Put the rolling pin away, use the push method. It will look rustic but the finished result tastes and looks great!